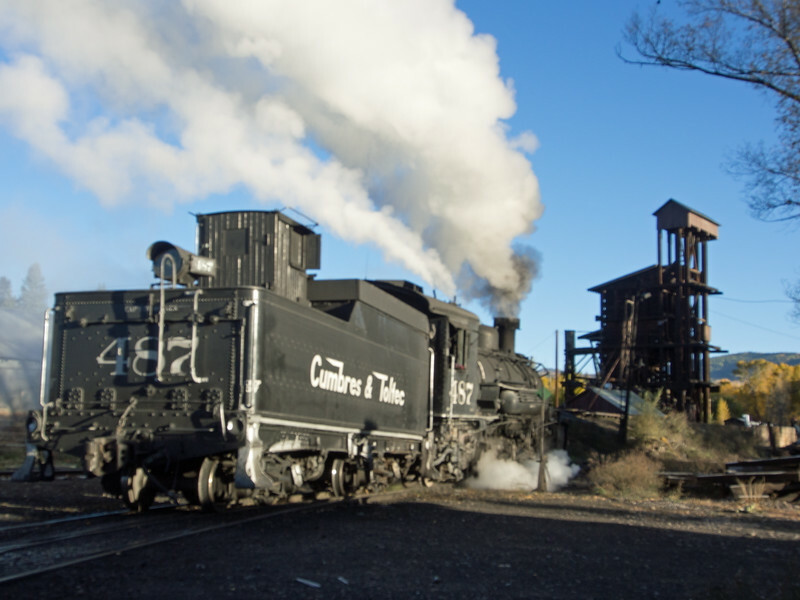 There is no better or more timeless place to wander around on a crisp October early morning than the Cumbres & Toltec engine terminal in Chama NM. Here K36 #487 heads out of the house towards the ash pit and water tank. While the big coaling tower still stands, the actual coaling work these days is done quickly and easily off an embankment using a front end loader.The coaling dock was set up for a time when coal was delivered in rail hopper cars, and a mechanical hoist was used to lift the coal into the bunker. Today the coal is delivered over the road using trucks. But the Friends of the Cumbres and Toltec are working to preserve the tower and get it back into operation for demonstration and historical purposes.